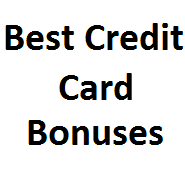 A list of the best current credit card sign up bonuses & offers for April, 2019. We update this page on a daily basis with any new deals and include all bonuses (we don’t use any credit card affiliate links so we can remain unbiased unlike other sites). Given how popular our best bank account bonus page is, I thought I’d try my hand at something similar for credit card bonuses. This page will be updated regularly, so feel free to bookmark it and share it on social media/forums (I’ll also add it to the header under credit cards to make it easily accessible). Keep in mind we do not use credit card affiliate links, so this is an unbiased list. There will be a random amount of entries on this list at any one time dependent on how many cards I currently think are worth signing up for. I’ll be taking into account whether a bonus is at it’s highest level ever or not (mostly because I don’t think an offer is truly the best if it regularly goes up to a higher level or I suspect it’ll go to a higher level in the near future). I won’t be taking into account special application rules (e.g Chase 5/24 rule or American Express once per lifetime rule), but I will mention them clearly. If there is a card that is popular and I haven’t included, I’ll put it under “Not On The List” and explain my reasons why. Keep in mind that having a clear goal will help you decide what the best cards for you are! If you don’t want to travel and just want to earn cash back, then the best card for you will be different than somebody that wants to fly first class to Paris and stay in 5 star accommodation. These cards are listed in order from absolute best to best (e.g the better cards are at the top). Annual fee of $89 is waived, this is by far the best bonus we’ve ever seen on this card. Standard is 50,000 points, we recently saw 60,000 and now we have this massive 70,000 point offer. Card has always offered the same bonus, but it’s still worth up to $750 so should be seriously considered. The bonus did actually get better when they added real time rewards meaning you didn’t need to use the U.S. bank travel portal to get 1.5¢ in value. This card isn’t available online anymore. Card also comes with $100 in travel reimbursements each year and the annual fee of $175 is waived the first year as well. Points are worth 1¢ each so this bonus is worth $400 + the $100 in travel reimbursements. We used to have this card at #1 as it seemed like it would be pulled sooner rather than later, but after about one year of still sticking around after a possible March 31st, 2018 end date I really don’t think there is much of a rush anymore. Card comes with a 50,000 point sign up bonus worth $500 towards statement credit. In addition you get a $100 travel credit each calendar year, downside is that this can only be used on domestic originated flights (not sure how or if this is actually enforced yet) and a $95 annual fee. Card comes with a $500 cash bonus. $95 annual fee is waived the first year. Standard offer on this card is 50,000 points with the $95 annual fee waived. This is an extra 10,000 points but without the annual fee waived. The extra points are much more attractive due to the flexible point transfers and the fact that points are worth 1.25¢ each when redeeming through the Chase travel portal. You can also get referred and person referring you will get an extra 15,000 points. Standard bonus is 10,000 points. We’ve seen the 25,000 point offer via incognito mode for some time but the 0% APY + $0 BT fee offer is new. Could be using for floating money to put into a high yield savings account. We’ve seen bonuses of 125,000 points before or 100,000 points + free night on anniversary. This is a better bonus if you value points or don’t want to pay a second annual fee.You can also get another free night certificate if you spend $15,000 within a calendar year. Biggest offer we’ve seen on this card by far, normally it’s only 60,000 miles. Worth considering if you have plans for Hawaii, best value is the internal Hawaii flights for 7,500 miles one way. Points are worth 1¢+ each. Card doesn’t get much coverage on other sites but considering it’s a bonus of $500 for $5,000 in spend it’s definitely worth considering. Maybe not as good as the Wells Fargo Propel World card we listed further above, but some people have had trouble getting that offer recently and this one can be done online. The downside to this offer is that it requires $15,000 in spend to get the full bonus. The sign up bonus on this card is low ($50 when you use a referral) but the real bonus is that after the first year you get your cash back doubled for that year (not including the $50 referral bonus). This card has 5% rotating categories (up to $1,500 in spend per quarter), this means you’ll get 10% cash back on those categories. This card really only makes sense if you’ll be able to max out those categories at least some of the time. Not the biggest bonus, but it does come with a $100 annual travel credit statement and there is no annual fee so there should be good long term value to keeping this card. Definitely the smallest bonus on this list, but when you use a referral link the person’s link you use also receives a $100 Disney gift card. Usually this bonus is a $200 Disney gift card and the person referring you receives a $50 gift card, so significantly better than normal. It’s also not subject to the Chase 5/24 rule. Best offer ever we’ve ever seen on this card. Holding this card also gets you discounted award flights and points don’t expire as long as purchases are made on the card. Nice and simple $500 bonus for $5,000 in spend. Deal becomes even better when you pair it with a new Wells Fargo business checking bonus of $500 or $1,000. We didn’t have this post listed for a long time and that’s because we’ve seen a bigger bonus of 100,000 points in the past. We were hopeful that would return, but at this stage that doesn’t look likely and it makes sense to grab this 80,000 offer instead. Standard sign up bonus is only $300, it has been possible to get $500 by applying through a business relationship manager for some time but that won’t be available to everybody so this offer is useful. Keep in mind this card does not count towards your Chase 5/24 total, but the Chase 5/24 rule does apply. Previous offer on this card was 100,000 points. I don’t see it going any higher than 125,000 points in the short to medium term so if you have a need for Hilton points then this card is worth signing up for. Also a nice extra $100 when doing a dummy booking via Hilton. This is the standard bonus on this card, we’ve never seen a higher or lower bonus as far as I’m aware. Similar to the United card above this does not count towards your 5/24 status but the 5/24 rule does still apply to this card. As long as you already have another Chase UR earning card with an annual fee you can transfer these points to Chase’s travel partners. This requires $1,000 in spend whereas a previous bonus only required a single purchase. Still well worth considering though. This also requires opening a checking account. Bonus is worth doing because the card earns 5% cash back in rotating categories as well. Really only worth doing the $500/$1,000 deals and even then it might just be best to wait for the $1,000 offer to return if your state is only offering $500 currently. Not everybody is able to get this offer to show, but if you are then it’s a great offer. Just keep in mind it does have a massive $550 annual fee, but for that you get good lounge access, $200 in airline incidentals per calendar year (so you can get it twice and only pay the annual fee once) and $200 in Uber credits per card member year as well. Obviously not for everybody, but if you can maximize those airline incidentals then this is a really great offer. There is also an upgrade offer of 60,000 points without the lifetime language, unfortunately that is targeted. It’s currently possible to get up to 75,000 miles and up to $200 in statement credits on the American Express Delta co-branded cards. These offers don’t have the lifetime language present, meaning you’re eligible for the bonus even if you’ve had that specific card before. This section explains why some popular cards/offers aren’t listed. Citi American Airlines 70,000 mile personal/business cards. Previously it’s been possible to sign up for an offer of 50,000 miles + $200 and then get matched to 70,000 miles and still get the $200 in statement credits. Currently there is a 40,000 + $200 offer, so I’m hopeful that 50,000 + $200 offer that can be matched to 70,000 will come back soon. I thought it would be useful to list when and why I make changes here. [11/01/18] Removed Barclays Aviator Business 60,000 Miles. Bonus reduced to 50,000 miles. [09/24] Removed Merrill+ 50,000 Point Offer. [07/27] Removed Chase Southwest Personal Plus/Premier – 60,000 Points as they are no longer valid. [02/26] Added Citi Business AA 50k offer as it contains no 24 month language. [o2/21] Removed Citi American Airlines 50k/60k offer because the no 24 month language link has died. I’m looking forward to the comments on this one, what do you think I’ve gotten wrong? What should be higher and what should be lower? What missed out and what should be removed from the list all together? Thanks, great article with a helpful round-up. Just a small clarification: the Citi Prestige has a $250 airline credit, not a $300 travel credit. No mention of Starwood and Marriott cards that are now eligible to be combined?Some really sweet possibilities there. SPG is under YMMV, I guess the 80k Marriott offer is OK but nothing that remarkable IMO. Curios when Marriott will offer more than 80K and/or waive the AF again? Now it is 75K and AF waived. Lot of us posted our referral links. I’m not sure I agree with your take on Sky Miles. Granted, they’re clearly the least valuable of the legacies, but Pay With Miles provides a floor that gives a minimum value of $500/$700+ on some of those Delta cards. The increased offers going on make them must-looks if you ask me. A lot of people, myself included, soured on Delta with their unannounced devaluations and generally shady practices when it comes to their frequent flier program. That being said, Delta generally gets good reviews for their service and they have a ton of non-stops from ATL, CVG, DTW, LAX, MSP, JFK, LGA, and SLC. In my opinion the Delta Gold Personal card should not be applied for unless you are targeted for the 75k offer. However, the Delta Platinum Personal probably deserves a spot above the IHG card on your list and I think both versions of the Business card deserve spots at the bottom of your list (below SWRR). My thinking with the current skymiles offers is that they will increase in the short term (as evidenced by the near constant 50k/70k offers) and the fact that there is no real need to hold these miles. If you have short term plans for Delta miles it can make sense, but I expect increase offers for both cards in the short term and also devaluation of Delta miles in the short-medium term. Annual fee on the Platinum card doesn’t help it’s cause either, maybe offset by the MQM for some people? Again, happy to argue these points and update list if I am in the minority/wrong. I guess the fear of increased offers is somewhat fair, but do you really see these cards hitting a six figure sign up bonus? That seems like the next step for Amex (100k DL Plat) to take with these if they really want to make a splash and drive sign ups, but I just don’t see them parting with such a huge crop of miles. My understanding is that the Delta card portfolio is relatively successful and the addition of card spend to waive the MQD requirement has probably helped them stave off deserters. In summation, I personally don’t see how the Delta Personal Platinum (70k miles/effective $95 fee first year with statement credit) can be left off your list of best personal sign up bonuses when the US Bank Amex is on there. I thought on the Amex Business Plat the total spend was $15k in total, not 10k? Although it would be great if it were! Thanks for compiling this list! Looks good! Pretty sure the Amex Platinum Business is $15,000 total. $5,000 first 50k points, $10,000 for second 50k set. Double bonus and not a good time for CSR, you disagree? Under “Personal Cards” I think you meant to write “best to worst” instead of “best to best”. No, I meant best to best haha. All of these offers are good! I never saw the 100k/125k AmEx Hilton links. Do you have those? They aren’t available, were leaked for a few hrs and then died. GASP! This improves my life greatly. TY!!!! Dad’s application submitted about an hour ago and received a call from their consideration line 866-224-7803, was approved instantly over the phone. 5K credit line. Like mine, he has Experian frozen and asked them to pull from Trans Union instead, 745 on trans Union via Credit Karma. It appears that 5K is the lowest credit line but it is totally fine because only the sign up bonus matters. It looks to me that Merril Lynch is very aggressive on getting ppl using their credit card, therefore approving without even mentioning on short credit history or number of hard inquiries in report. Funny thing is that my Dad previously did not even get approved for BofA’s cash reward credit card. No love for Spark Cash? $500 cash after $4500 in spend….better spend then the amex $500 bonus plus 2% on everything. Pays out immediately too – before the statement even closes! They pull all three bureaus, I was considering all them as inquiries are combined AFAIK. And most likely to deny you anyway. This is what keeps me away from Capital One. I am leaning more toward the CSP if I can get a Chase in branch preapproval vs CSR. Adjusting the reward vs AF and not having to game the $300.00 travel credits when I will not be traveling just makes more sense to me. 7/12 Currently. One new business card on top of that which has not had time to hit the credit bureaus if it does. The problem is I do not see enough sizzle in anything out there to drool about except the CSP or CSR. At the rate I am going, I may be a one year wonder as very little pumps my juices for 2017 in terms of new credit cards or bank accounts. You should still be able to get matched to the 70k in branch offer for the Ink Plus. You sure? Card isn’t available officially anymore in branch so not sure they would still match.